Due to the recent tragedies related to gun violence around the country, there is far more attention placed on security than ever before. Places of business are taking new measures to ensure the safety of its staff and defending against threats, such as active shooters. Office panic alarm systems are becoming much more desirable, as they provide a business the opportunity to identify, not only which staff member is under duress, but where they are, and what kind of distress they are in. 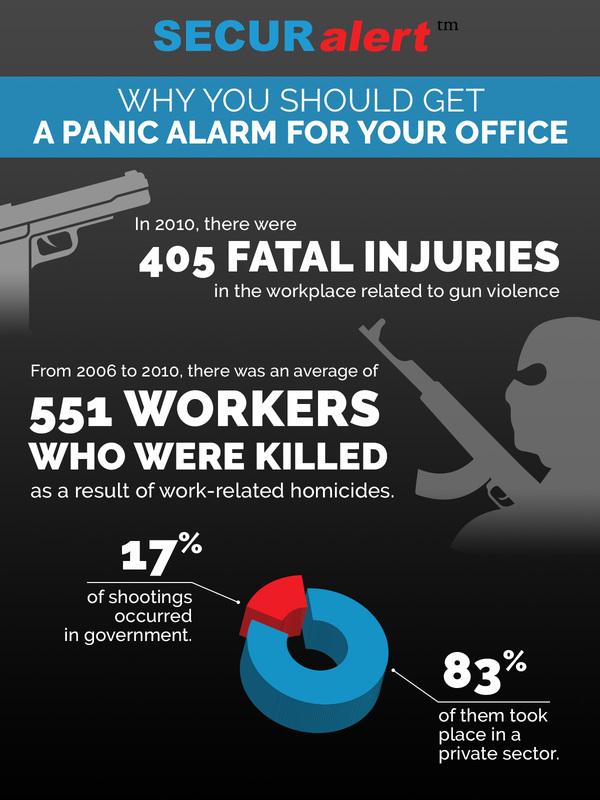 In this blog, we will give you reasons why having an office panic alarm is a great option for your business. With our technology, you will be able to keep your staff and business safe from threats that intend to do them harm. SecurAlert uses radio frequency and ultrasonic technology in order to locate where our duress button has been pressed. This allows authorities to know exactly where the person in duress is. By using this form of advanced technology, you no longer have to guess where the threat is or what employee is in trouble. If every employee has their own duress button, they have a way to signal if they are threatened or need immediate medical attention. Regardless of the reason the button was pushed, having a reliable location system in monumentally important for the safety of your business. Though it might seem like your business is under no real threat, you don’t want to be surprised. Being able to prevent an incident — or at least prepare for it — is the best way to ensure everyone’s safety. For example, in 2010, there were 405 fatal injuries in the workplace related to gun violence — accounting for 78 percent of workplace homicides. Of these shootings that occurred, 83 percent of them took place in a private sector. It is wrong to believe that schools, hospitals, and correctional facilities are the only facilities that can be targeted by active shooters. Office spaces are actually much more targeted. In fact, from 2006 to 2010, there was an average of 551 workers who were killed as a result of work-related homicides. Since offices can be targeted by angry customers or disgruntled employees, it is important to keep all staff members safe. An excellent way to be able to protect staff during high-risk situations, is by being able to know their location in the building. During an active threat, chaos can ensue. However, with SecurAlert, if a staff member is under severe duress, they can signal the proper authorities. This will not only alert the police and building security of a threat, but who on staff is in trouble, as well as where the threat is coming from. This can help police locate the culprit and detain them before they hurt any of your staff. By giving each of your staff members their own SecurAlert duress button, you will be able to arm each of your staff members with a signal device that has the potential to save lives. If you are interested in keeping your staff members staff from any threats, such as an active shooter, a fire, or even their own medical issues, contact SecurAlert. We can help you keep your staff safe with high-quality technology.